It’s Sunday on Bonnie Bumble’s farm, and snowflakes as big as balls of wool are falling. The cow, the duck, the hens, and even Spot the dog are all chilly and shaking. “This will never d-d-d-do,” says Bonnie with chattering teeth—and soon is busy with needles and yarn, knitting something cozy for everyone. But how can she make the sun beam again in the big cold sky? Picture-book luminaries Phyllis Root and Helen Craig wind up their Bonnie Bumble series with a funny tale offering an unexpected twist. Phyllis Root and Helen Craig knit together a suitably sweet finale to Bonnie Bumble’s week on the farm. 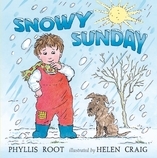 24 / 8" x 8"
Phyllis Root is one of today’s most gifted picture-book writers. Her acclaimed and beloved books include One Duck Stuck, Big Momma Makes the World, Ten Sleepy Sheep, Oliver Finds His Way, Scrawny Cat, Rattletrap Car, Looking for a Moose, and Kiss the Cow! as well as six other books in the Bonnie Bumble series. She lives in Minneapolis. Helen Craig is a widely acclaimed illustrator of books for children, including This Is the Bear by Sarah Hayes, The Yellow House by Blake Morrison, A Finder’s Magic and Amy's Three Best Things by Philippa Pearce, and the hugely popular Angelina Ballerina stories by Katharine Holabird. Helen Craig lives in England.